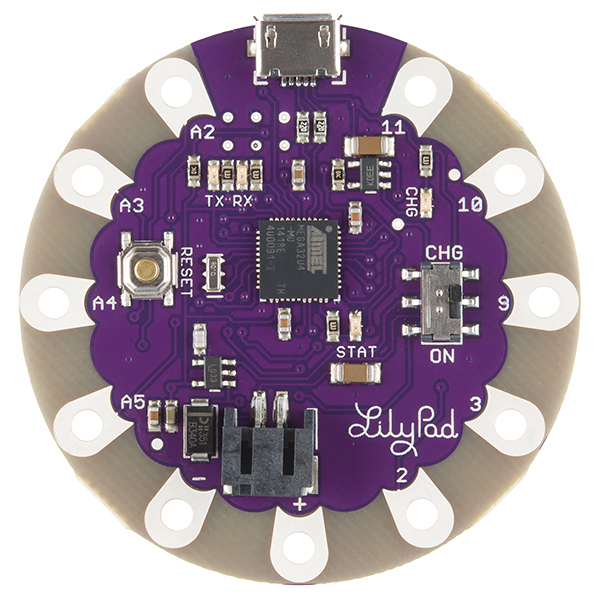 You are ready for your first programmed LilyPad project, but which LilyPad Arduino do you choose? In this guide, we'll go over the features of each of the Arduinos in the LilyPad line and their strengths and weaknesses. We've put together a quick feature comparison chart below. For more detailed technical specs, check out our Arduino Comparison Guide for LilyPad. If you have never worked with LilyPad or other wearable technology before, you may find the following resources useful. The LilyPad Arduino Simple Board is one of our most popular for beginner Arduino projects because of its spacious layout. It is easier to identify pins and has more room for stitching without the risk of accidentally touching other pins on the board. The built-in battery port makes it easy to choose a LiPo battery that suits the run time requirements of your project and recharge the battery by simply plugging the board into a USB port on your computer or 5V wall charger. The LilyPad Arduino Simple Board needs a LilyPad FTDI Basic Breakout and USB Mini-B Cable in order to connect to a computer and upload code. The LilyPad Arduino USB is similar to the LilyPad Arduino Simple Board, but uses a different chip - the ATMega32U4, which has built-in USB support. If the FTDI header pins on other LilyPad Arduinos feel too bulky or FTDI Boards are often lost or misplaced, this board is a great alternative. Note: the digital I/O pin layout is slightly different than the LilyPad Arduino Simple - the USB uses pins 2 and 3 instead of 5 and 6. The LilyPad Arduino USB needs a Micro USB Cable in order to connect to a computer and upload code. Because the battery is soldered to this LilyPad Arduino, it cannot be washed. Unsnap the LilyPad from its base before washing. 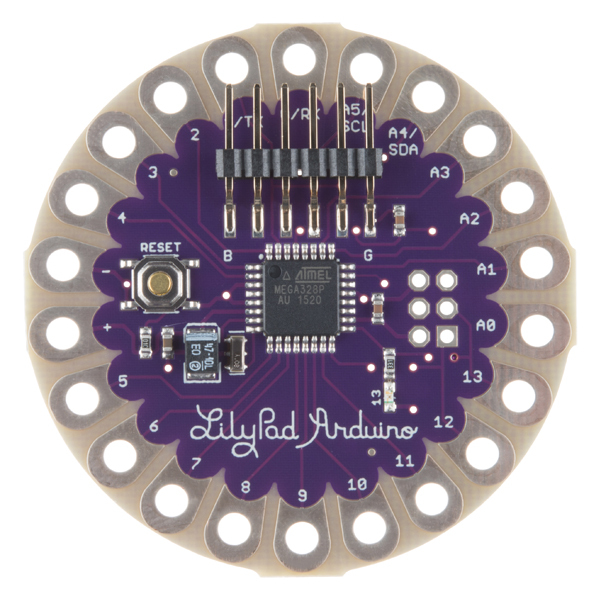 The LilyPad Arduino SimpleSnap is similar to the LilyPad Simple Board, except for two major differences: a built-in rechargeable 110mAh LiPo battery and female snap connectors. This board requires connection to a SimpleSnap Protoboard or an arrangement of sew-on fabric snaps so that the board is removable from a project. This gives you the ability to swap out the LilyPad Arduino to reprogram and share in multiple projects. The LilyPad USB Plus is an update to the LilyPad Arduino USB, with additiona tabs, labeling, and built-in features. The USB Plus includes an RGB LED at the center for quick prototyping without connecting additional parts, and a row of 6 white LEDs for indicator lights or simple data visualization. Note: the USB Plus is not currently supported on Windows 7 operating systems. The LilyPad Arduino 328 Main Board has all of the ATmega 328 pins available for connecting to a wearable project. This board is recommended if your project needs access to more analog input pins than the other LilyPad Arduino offerings. Unlike the others, it does not have a battery port -- you will need to stitch a power supply to the + and - pins on the board. We recommend the LilyPad Simple Power board to provide a LiPo connection and charging circuit to your project. The LilyPad Arduino 328 Main Board needs a LilyPad FTDI Basic Breakout and USB Mini-B Cable in order to connect to a computer and upload code. LilyPad ProtoSnap boards are a great way to get started learning about creating interactive e-textile circuits before you start sewing. Everything is wired together on a single board, which makes it easy to explore the possibilities of the components before snapping them apart and building the individual pieces into your project with conductive thread. 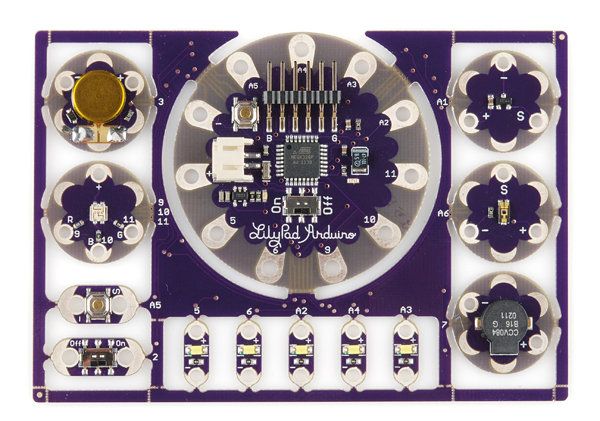 The LilyPad ProtoSnap Plus is a way to prototype with LilyPad Arduino and components that are pre-wired together. 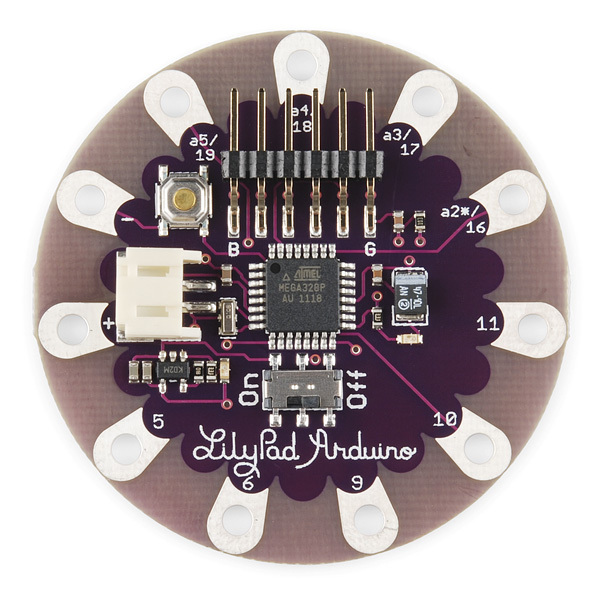 After uploading code to the LilyPad Arduino, you can easily snap apart the components and sew them into a project. The LilyPad ProtoSnap Plus needs a USB Micro-B Cable in order to connect to a computer and upload code. 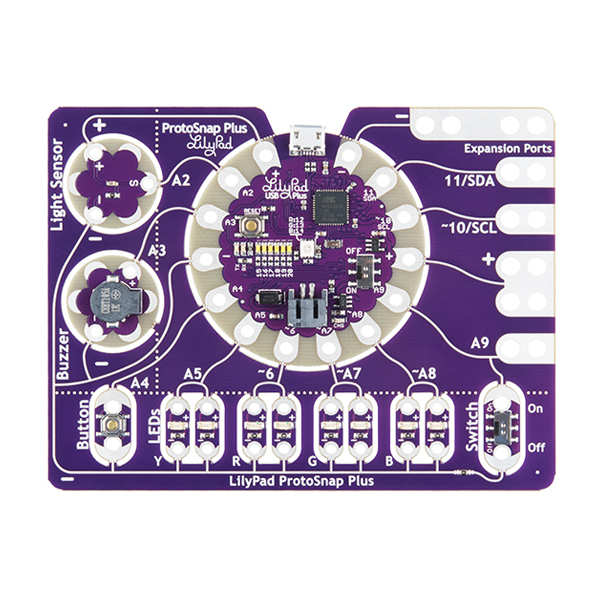 The ProtoSnap - LilyPad Development Board is the classic LilyPad Arduino ProtoSnap kit with a LilyPad Simple Arduino and set of LilyPad pieces pre-connected. It also includes needles, conductive thread, and a battery to get started prototyping and building quickly. 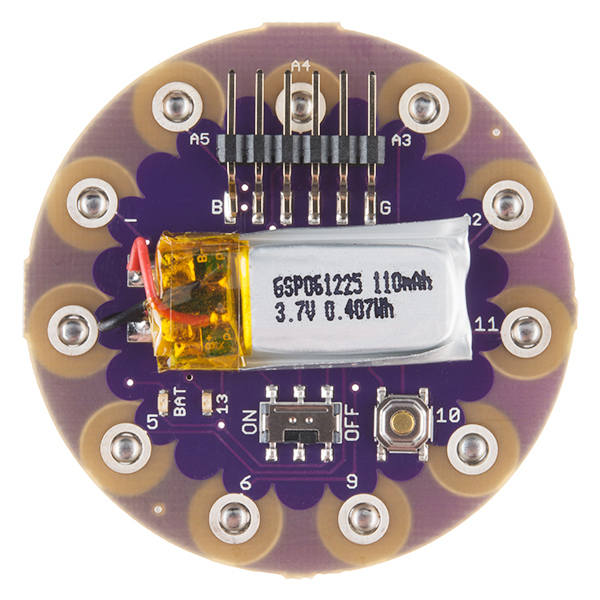 The ProtoSnap - LilyPad Development Board needs a USB Mini-B Cable in order to connect to a computer and upload code. The ProtoSnap - LilyPad Development Board Simple is similar to the Development Board, but with less components pre-wired to the Arduino. The ProtoSnap - LilyPad Development Board Simple needs a USB Mini-B Cable in order to connect to a computer and upload code.